Unlike many other areas in the United States that are still struggling to recover from the recent recession, Louisiana’s economy, fueled by ongoing growth in the gas and oil industries, continues to expand. The Gulf State’s energy boom is predicted to create hundreds of thousands of new jobs, with the demand expected to be highest for pipefitters, welders, electricians and other skilled trades workers. Already there is talk of potential worker shortages, and the federal government has allocated millions of dollars in job-driven training grants to ensure that the need for skilled trades workers is met. Professional welders are and will likely continue to be highly sought-after. At present, Louisiana’s oil and gas industry has driven more than $103 billion in construction projects that are either under construction, completed or slated to start soon. Not only will this building boom trigger a spike in skilled construction jobs but it will also contribute to Louisiana’s record-breaking job growth: with an additional 34,000 jobs projected, the state is expected to surpass 2 million overall jobs in 2015 and add another 32,600 the following year. The greatest job growth is predicted in the cities of Baton Rouge, Lafayette and Houma, as well as in Lake Charles, which experienced a more than 25 percent increase in construction employment—the most growth among the almost 340 metro areas reviewed by the Associated General Contractors of America. From July 2013 to July 2014, the metro area saw the addition of nearly 3,000 construction jobs. 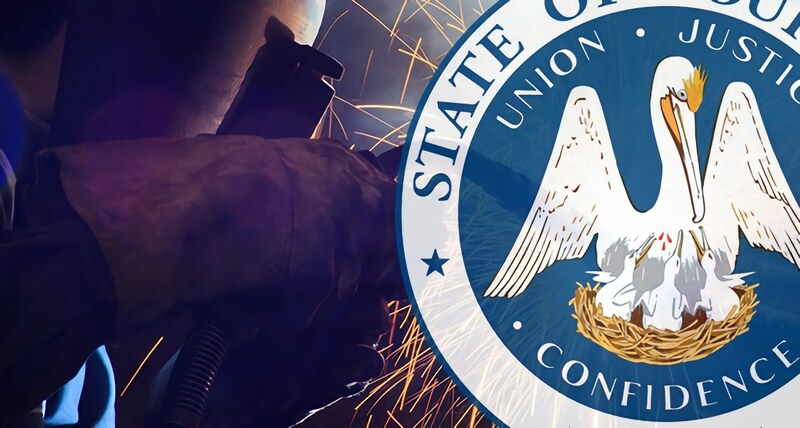 In that same time period, Louisiana saw an increase of 7 percent, or 9,000 new construction jobs, with a total of nearly 140,000 statewide, many of them in the petrochemical industry. With a combined workforce exceeding 5,000 workers, the luxurious Golden Nugget Casino Resort, owned by Texas billionaire Tilman Fertitta, and the Cheniere Energy LNG export facility in Johnson Bayou are two of the largest construction projects in the region. Over the next three to five years, a dramatic increase in construction jobs is predicted for Southwest Louisiana, accounting for approximately $77 billion of capital investments. With billions of dollars predicted to be spent on facilities to accommodate the energy boom along the Gulf Coast in the coming years, some in the industry anticipate a strain on the labor force for not only construction workers but also for pipefitters, welders and electricians, as well as other skilled trades workers. In response, some firms have increased pay and benefits to attract qualified workers to the area, and the federal government, co-administered by the Department of Labor and Department of Education, has stepped in to aid the skilled trades, with Vice President Joe Biden announcing $450 million in grants to provide training for in-demand jobs in 2014. Anticipating the possibility of worker shortages in the skilled trades, vocational schools have also ramped up their training programs. The number of pipefitters, welders, electricians and other skilled workers in the Gulf Coast is expected to grow from roughly 62,000 to more than 103,000 in the next two years. Tulsa Welding School offers hands-on technical training to prepare students for successful entry into the skilled trades to meet the demand in Louisiana and throughout the region. Those wishing to join the forces of workers aiding the energy boom in the area may contact us to learn more about the professional welding and pipefitting training programs offered.